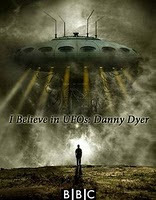 "I Believe in UFOs" is a recently aired BBC Documentary presented by Danny Dyer who goes on a quest investigating Aliens, UFOs, Crop Circles and other ultra dimensional magical light phenomena experienced and observed by many all around the world. Danny talks to prominent researchers, UFO enthusiasts and others who believe having experienced something unknown & mysterious, possibly of Extraterrestrial origin. Spirit Guides, Angels, ETs ... Multi-Dimensional Light Beings !